The Santa Fe Chair Car 2823 was built in 1953 by the Budd Corporation, Philadelphia, Pennsylvania, as a long distance 48-seat chair car for the Atchison, Topeka, and Santa Fe Railroad. The Santa Fe never named the car, but numbered it #2823. This car operated on the “El Capitan”, the “San Francisco Chief”, and the “Texas Chief” consists. As Amtrak prepared to start service in May 1971, 1,200 cars were selected from a pool of 3,000 that were in service with the two dozen railroads that had been relieved of their passenger service obligations. Like The Silver Maple and Chair Car 2931, Santa Fe 2823 became part of the Amtrak fleet. Amtrak renumbered the car #4817. Montana Rockies Rail Tours (MRRT) acquired the car in 1995. The rail route covered by the MRRT included the original Northern Pacific Railroad tracks through southern and western Montana and northern Idaho. It was not only a very scenic route, it is a historic route that no other passenger trains traverse today! The train MRRT operated was named the Montana Daylight. MRRT renumbered the car 4700. MRRT ran excursions covering 478 miles. The motive power was usually provided by Montana Rail Link, however several trains were pulled by Southern Pacific 4449. MRRT ceased operations in 2004 and sold of their rolling stock. Back to its old self! 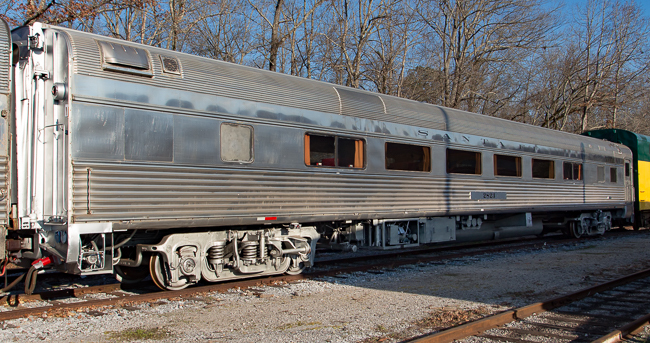 In 2016, the Heart of Dixie Railroad Museum restored the exterior of the car back to its original Santa Fe 4700 appearance. "Kayenta" was removed from the number board and renumbered 2823. Santa Fe was put once again on the band above the windows just as it showed in 1953. The blue paint on the window band was removed putting the car back to its shiny sleek stainless steel streamlined look.